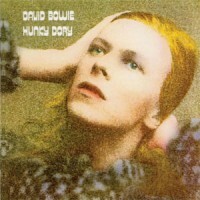 "After the freakish hard rock of The Man Who Sold the World, David Bowie returned to singer/songwriter territory on Hunky Dory. Not only did the album boast more folky songs ("Song for Bob Dylan," "The Bewlay Brothers"), but he again flirted with Anthony Newley-esque dancehall music ("Kooks," "Fill Your Heart"), seemingly leaving heavy metal behind. As a result, Hunky Dory is a kaleidoscopic array of pop styles, tied together only by Bowie's sense of vision: a sweeping, cinematic mélange of high and low art, ambiguous sexuality, kitsch, and class. Mick Ronson's guitar is pushed to the back, leaving Rick Wakeman's cabaret piano to dominate the sound of the album. The subdued support accentuates the depth of Bowie's material, whether it's the revamped Tin Pan Alley of "Changes," the Neil Young homage "Quicksand," the soaring "Life on Mars?," the rolling, vaguely homosexual anthem "Oh! You Pretty Things," or the dark acoustic rocker "Andy Warhol." On the surface, such a wide range of styles and sounds would make an album incoherent, but Bowie's improved songwriting and determined sense of style instead made Hunky Dory a touchstone for reinterpreting pop's traditions into fresh, postmodern pop music." - Allmusic.